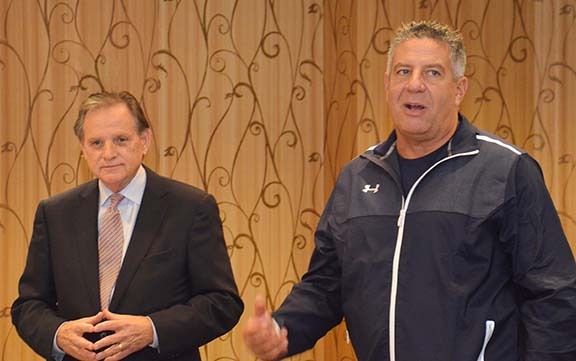 National Campaign Co-Chair Wayne T. Smith introduced Coach Bruce Pearl, who addressed the College of Education’s Development Leadership Team at its quarterly meeting. On Friday, October 3, Auburn head basketball coach Bruce Pearl stopped by to offer his support for the College of Education’s Development Leadership Team at its quarterly meeting. He was introduced by National Campaign Co-Chair and two-time College of Education graduate Wayne T. Smith. Pearl acknowledged many of the political trends that are working to undermine public education, but said he remains a steadfast supporter of this uniquely American hallmark. Pearl talked about basketball and his players, but only as a way to underscore that he is working to create a culture of respect and honesty, hard work and selflessness, when it comes to those things that his players do off of the court. Pearl’s closing remarks, in which he predicted a big win for the football Tigers against LSU, and waxed eloquent on the beauty of Auburn’s campus and spirit and the fresh fall weather, were more like a rousing religious benediction than a pep talk about raising money.